Roasted Brussels Sprouts with Grapes. Healthy and Yummy! Home Recipes Dinner Roasted Brussels Sprouts with Grapes. Delicious! Roasted Brussels Sprouts with Grapes is a delicious combination and it’s so easy to prepare. So many people I know do not like Brussels Sprouts and that might be because we grew up eating them boiled. Roasting Brussels sprouts is the way to go. Roasting Brussels sprouts help bring out a sweeter flavor in vegetables and breaks down the bitter profile of most vegetables. Feel free to season your Brussels sprouts however you want. Some great options include parmesan, paprika, oregano, and more! This is just how I like my roasted Brussels sprouts. Delicious roasted Brussels sprouts go lovely with the sweetness of roasted grapes. Wash the Brussels sprouts and cut off the ends, and then cut them in half the long way. 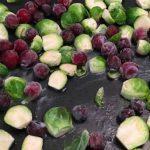 Mix the Brussels sprouts, grapes and coconut oil in a roasting pan. Evenly spread everything out on the pan and place in the oven to roast. Let cool a few minutes and enjoy! Previous articleApple Pie with Pecan Crust (Paleo, Sugar-Free and Grain Free) Delicious Too!